My first non-clinical physical therapy job was working as a rehab liaison at South Bay Rehabilitation Center (at Paradise Valley Hospital in National City, CA). It was an excellent non-clinical job and, had I not discovered a passion compulsion to write for a living, I probably would have worked there forever. Seriously, the job was that enjoyable. What is a rehab liaison? 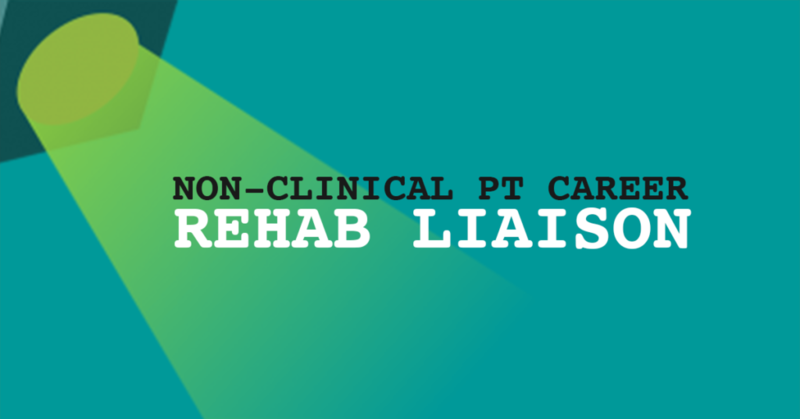 A rehab liaison is the person responsible for finding potential patients for an acute rehabilitation facility (ARF) – which is also known as an acute rehab unit (ARU) – and then screening those patients to see if they’re good matches. This is a very basic idea of what makes someone appropriate for acute inpatient rehab. Neuro diagnosis – TBI, MS exacerbation, CVA, etc. Trauma diagnosis – MVA with multiple injuries, etc. Marked functional decline – For example, someone was Min A with transfers and is now Max A. Needs 24 hour medical care – Can this patient recover just as well in home health or outpatient rehab? Will benefit from 3 hours of intensive therapy per day – If the patient can’t tolerate, or won’t benefit from it, they’re not appropriate. Has active insurance that covers inpatient rehab – Sad, but true. Bear in mind that the role itself requires adherence to a much stricter set of criteria. Some facilities apply Medicare criteria to all patients, while others require liaisons to know specific admission criteria for specific insurance carriers. If these patients are good matches, you’ll often run insurance, work with case managers, collaborate with the rehab team during rounds, and work with the rehab MD at your facility to follow that patient. What does a successful rehab liaison look like? Outgoing – You’re going to have to initiate conversations with complete strangers and really sell your program to everyone, from physicians, to marketers, to patients and their families. Goal-oriented – You’re going to need to meet census quotas and if too many beds in your facility are empty, it will likely be on you to explain why. That said, some facilities are more firm about their quotas than others. Communicative – You’re going to need to explain how you’re different from a nursing home to many different types of people with different educational levels. You will also have to break news to patients whose insurance won’t cover their stays, and you’ll need to work between facilities to ensure vital patient records (and the patients themselves!) are transferred in a timely manner. Organized – You’re going to be neck-deep in paperwork, and you’ll meet so many different people in your role, keeping their names straight will be an art form. Insurance plans are also frequently changing, so you’ll need to have a system to stay organized and understand how these changes will impact both your facility and your patients. Compassionate – You’re going to be working with people who need acute inpatient rehab. They’ve just had some serious issues take place in their lives. Just like a treating clinician needs to be compassionate and respectful of his or her patients, a good rehab liaison is understanding, patient, and kind. Experienced – You’re going to want to really understand what rehab prognoses look like in this role. If you’ve worked in acute inpatient rehab or acute care in the past, you’re an excellent fit for the role, while you might struggle a bit if you’ve only worked in outpatient or pediatrics. While new grads can certainly make good rehab liaisons, it might be a steep learning curve. Connected – You’re going to be working with tons of physicians, case managers, assisted living facilities, and more. If you already have a relationship at a few large facilities in the area, you’ll be at a huge advantage in this role. Detail-oriented. You’re going to be working with lots of insurance companies. Be aware that if you’re the type who constantly spells Aetna wrong on paperwork, you’ll make your department look bad. What does a day in the life of a rehab liaison look like? A slow day in the life of a rehab liaison can range from sitting in the intake office, screening candidates for appropriateness (based on active referrals, the census at the hospital – if your ARF is located within a larger hospital), printing out copies of intake paperwork, following up with some ongoing cases, creating flyers and brochures for facility events, or even decorating the rehab unit! You might spend the morning offsite, seeing patients at 2-3 facilities around town. You’ll fill out preliminary paperwork or worksheets, then present these cases to the rehab MD at your facility. If you’re on your own, you might even run the insurance for these patients and fax notes to/from the patients’ insurance case managers. You’ll then return to the ARF and attend rounds, reporting on all the patients you brought into the facility. You may then fill out intake paperwork for patients that your rehab MD accepted and work with insurance case managers to get authorization for your patients’ stays at the facility. Your day will wind down with you completing outstanding paperwork, ensuring a smooth transition for any admitting patients, and preparing an end-of-day report. Some days in intake are focused on analytics, especially if referrals are sparse. You might sit in front of a spreadsheet, poring over how many of your referrals actually converted into patients in beds. Other days might be spent actively marketing. This might involve attending mixers and facility openings, dropping off materials to physicians’ offices, or swinging by case managers’ offices around down to schmooze. Some facilities have very strict rules about drop-ins, though, so this aspect of the job will vary greatly. Validity. It’s easier to explain to people that you’re leaving patient care if you stay pretty involved in the field. In this case, you’re leveraging your degree in a setting that is clearly related. You’re barely out of patient care. Collaboration. Being a rehab liaison is great because it’s a truly collaborative role. There is typically more than one liaison at a facility, and you’ll work closely with your team. You’ll also work closely with the therapy department, rehab physician, nurses, and other staff members. Pay. Unlike other non-clinical jobs, you will likely make a salary that is close to what you’d make as a physical therapist. Variety. You’ll never get bored as a liaison. If you’re not getting enough referrals, you can focus on marketing. If you’re bored by marketing, crunch some numbers. You’ll be at rounds one morning and at a hospital by noon. Service. You’re truly helping patients in this role. By educating them about inpatient rehab, you can enable them to have intensive therapy they might otherwise not receive. Quotas. If referrals are slow and it’s out of your control, you might still be the one in the hot seat, explaining why the census is low. Unpredictability. The job can be extremely unpredictable. Slow days are sometimes painfully slow, and a fast day can make you feel almost crazed. No actual patient care. This might be a pro for anyone reading this site, but if you’d rather be a partial-clinical PT, a liaison job might be disappointing. You literally do no hands-on patient care. Occasional stress. Things can get a bit hairy in intake at times. This is part of why an organized person will excel in the role. Becoming a rehab liaison is actually fairly simple if you’ve worked in inpatient rehab and/or acute care. It’s even simpler if you’re well-connected around town. Make sure your non-clinical resume reflects your time spent in acute inpatient rehab, acute care, or even SNF settings. It’s all about making that non-clinical resume shine. Make sure to use the right keywords and highlight the right experiences in your resume. Try to chop out anything overly specialized from your resume, unless it is directly relevant in an inpatient rehab setting. For example, downplay your pediatrics experiences, and lengthen your sections about acute care, acute rehab, and SNFs. Ensure that you play up your experiences with working on multi-disciplinary teams, especially if you’ve participated in rounds, acted as point/lead therapist, or cultivated unique relationships with case managers and/or physicians. Keep this: Cultivated relationships with case managers, physicians, nurses, OTs, and SLPs by organizing annual rehab potluck. Keep this: Coordinated seamless scheduling of acute care physical therapists on weekends and holidays. Keep this: Exceeded stringent productivity expectations by collaborating with OTs by dovetailing appropriate treatments. Ensure that you mention any existing relationships you have with case managers, physicians, or therapy teams around town. This is one case where being a job-hopper might be an advantage. Explain that you have an excellent relationship with multiple hospitals around town and that you have experience with working with many different multi-disciplinary teams. Highlight any experience you have working with insurance companies, participating in rounds, meeting/exceeding quotas, or in leadership positions. Lastly, ensure that you highlight any marketing experience you have. Note: Even if you only worked in inpatient rehab and/or acute settings as a student, play up anything that relates to the liaison role. You’ll be happy that you did! Be as personable as possible in your interview. Smile frequently and use friendly body language. Be memorable and ask lots of questions, and do what you can to put the interview panel at ease by making pleasant remarks and the occasional joke. Be transparent about why you’re eager to take on a non-clinical role, without being too much of a downer. Again, discuss how much you enjoy collaborating with other clinicians and explain how you’re detail-oriented, and you’re not afraid to show follow-through. The importance of determining viable discharge plans. ARUs can’t afford to admit patients who don’t have a safe place to d/c after their stay. Pansies and pushovers need not apply to rehab liaison roles. There will be times that you’re vying for the same patient (sadly, it’s usually a patient with stellar insurance and a “perfect” neuro diagnosis) that another rehab facility wants. You’re going to need to step up your sales game and win that patient over. This does not mean you need to be aggressive. You simply need to have that competitive spirit and truly believe that your facility is the best and will be best for your patients. Make sure that you convey in your interview that you’re capable of stepping up to the plate and getting those patients in the door. It might be because you’re well-connected, or it might be because you’re an expert salesperson. If you can convince your interviewer that you’ll get those patients in the door, the job will be yours. None. If you’re a licensed PT, OT, SLP (sometimes) or RN, most acute inpatient rehab facilities (also known as ARFs or ARUs) will consider you for the role of a rehab liaison. In fact, some facilities will consider PTAs and OTAs for these roles, too! Don’t be discouraged by the roles that specify RN degrees. There are roles out there that accept encourage therapists to apply. We have unique skillsets and they should be embraced. One of the reasons I created The Non-Clinical PT is to empower us to take on these jobs and show that our degrees prepare us to shine in non-clinical roles! I have a question regarding licensure. These non-clinical jobs, do they still require that you keep up certification and licensure? I’m looking for a way to use my Bachelor’s degree (in OT) without having to also be current with credentials. I have been a stay at home mom and want to return to work in some fashion, however not in patient care, because of my own physical limitations. Hey Annette! Every non-clinical role differs in its licensure requirements. A clinical liaison and/or utilization review role does require current and active licensure. Many management and care coordination roles are the same. Telehealth also requires active licensure in the state(s) where the patients you treat reside. However, recruiting or adaptive clothing design roles would not. Hope that helps! If you add Some jobs and credit courses for Physical therapy degree holder who does not have license in USA, it would be helpful for a lot of job seeking foreign educated and licensed Physical therapy degree holders. Hi Nancy! Thanks for your comment. In my course (Non-Clinical 101), I cover this topic extensively! Happy Holidays!